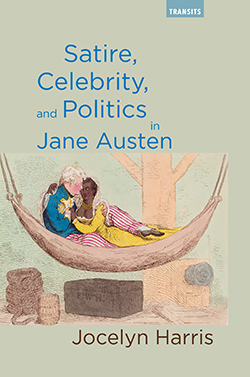 Jocelyn Harris’ 2017 book with Bucknell University Press, Satire, Celebrity, and Politics in Jane Austen, has recently caught the attention of Times Literary Supplement (TLS). A special segment, entitled “What Jane Saw: Exploring Austen’s creative hinterland and recoverable influences,” features some of the highlights of Harris’ book and its contributions to Jane Austen scholarship. The article is written by Emma Clery, a specialist of the cultural history surrounding Jane Austen and Professor of English at the University of Southampton. In Satire, Celebrity, and Politics, Clery explains, Jocelyn Harris’ “expertise and questing curiosity are brought to bear on a set of themes that have not generally been associated with Austen.” She goes on to summarize Harris’ main points, giving readers of TLS a glimpse into the book which highlights Jane Austen’s position as a satirist, her character inspirations in the form of celebrities, and how these elements contributed to an underlying commentary on politics within Austen’s novels. While Harris explores these topics in Satire, Celebrity, and Politics, Clery also gives mention to her previous publications (Jane Austen’s Art of Allusion and A Revolution Beyond Expression: Jane Austen’s “Persuasion”), all of which have made Harris “well established as a guide to the wider thought-world of the author.” To read the full article, see the February 9, 2018 edition of TLS, or subscribe to their database. To order Satire, Celebrity, and Politics in Jane Austen visit www.rowman.com or call 1-800-462-6420. Prices are $110 for cloth (978-1-61148-839-5) and $104 for eBook (978-1-61148-843-2).